The small state of Rhode Island has 12 institutions of higher education, from an Ivy League research university to liberal arts schools to community colleges. Rhode Island has schools big and small, urban and rural and many have online platforms as well. With such a variety of options, prospective students find that it can be difficult to compare to schools. Typically, it helps to distill these comparisons to a few factors. Location, affordability and program length are common factors that most students consider as they evaluate colleges. To help students make an informed decision, we have applied our rigorous methodology to the latest education data to rank the best colleges in Rhode Island, including the top four-year and two-year schools. Accounting for metrics that students value when examining schools, including acceptance, retention, graduation and enrollment rates, we've ranked the top colleges in the state of Rhode Island. Rhode Island is home to both public and private colleges, many of which boast a national reputation. Brown University, founded in 1764, is the state's oldest four-year college and is one of eight schools in the Ivy League. The University of Rhode Island is the largest school in the state, a major research university with a notably strong reputation in environmental and natural resource economics. Additionally, the Rhode Island School of Design is among the nation's most respected fine arts programs. Students can study a number of disciplines at schools throughout Rhode Island, and prepare for a career in their chosen field. In the aggregate, four-year degree-holders in Rhode Island earn a higher salary than non-graduates. Earnings vary based on your major and professional interests, but mid-career professionals with a degree can expect to make several thousand dollars more annually than people with a high school diploma. If you're interested in pursuing your degree in Rhode Island, our ranking of the top schools in the state is a good place to begin your research. Established in 1764, Brown University is one of the oldest and most respected universities in the U.S., and undoubtedly one of the best colleges in Rhode Island. Many famous alumni attended Brown, including CNN founder Ted Turner, author Jeffrey Eugenides, and "This American Life" creator Ira Glass. The competitive Ivy League school admitted just 8.5% of applicants for its 2019 incoming freshman class. Brown's undergraduate students choose from more than 50 bachelor's degree programs offered by the university in subjects ranging from Gender and Sexuality Studies to Science and Technology Studies. Unlike other Rhode Island colleges, Brown does not have a core curriculum, giving undergraduate students the opportunity to pursue "concentrations," and take the courses most relevant to their interests. For example, a bachelor's concentration on Archaeology and the Ancient World enables students to travel to pursue archaeological fieldwork in locations including Jordan, Egypt, and the West Indies. 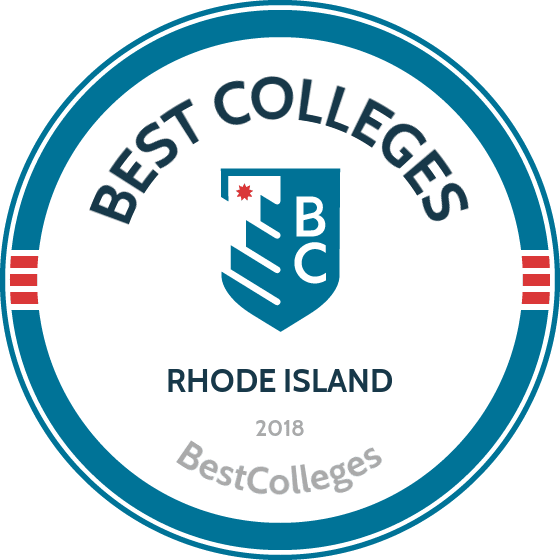 One of the best known art colleges in the U.S., Rhode Island School of Design (affectionately called "RIZ-dee" because of its "RISD" acronym) ranks among the best colleges in Rhode Island. RISD was founded by women in 1877, a time when most other institutions of higher education did not welcome women to their campuses. The school's roots of thinking outside the box continue to influence its commitment to fostering critical thinkers today. RISD undergraduate students pursue a studio-based education in 21 majors or concentrations, which is more than what is commonly offered at other Rhode Island colleges for art. Printmaking, apparel design, architecture, and furniture design are just some of the available undergraduate majors at Rhode Island School of Design. The most popular undergraduate majors are Illustration, Industrial Design, Graphic Design, Film/Animation/Video, and Painting. RISD boasts many well-known alumni, including filmmaker Gus Van Sant, glass artist Dale Chihuly, author and illustrator David Macaulay, and painter Kara Walker. Founded in 1917, Providence College is accredited by the Commission on Institutions of Higher Education of the New England Association of Schools and Colleges, Inc. Providence College is unique among Rhode Island colleges for being the only school in the country founded by Dominican Friars. Undergraduate students can choose their major from nearly 50 bachelor's degrees offered by one of the best colleges in Rhode Island. The most popular undergraduate majors include marketing, finance, biology, and accounting, and Providence College was the first in the country to offer a public and community service studies bachelor's degree. Providence encourages students to participate in research on campus, with 40% of students participating in research projects outside of class. Bryant University differentiates itself from other Rhode Island colleges by integrating business with the liberal arts and providing a global worldview. Bryant helps undecided undergraduate students choose a major with its Undecided/Exploratory Program, which provides students with personal career counseling, individualized academic advising, career assessments, shadowing opportunities, and a mentor program. Students choose from among dozens of degree programs, ranging from applied economics and international business, to entrepreneurship and marketing. Every Bryant University student chooses both a major and a minor to broaden their worldview. One of the best colleges in Rhode Island, Bryant's campus has recently seen a $250 million investment, resulting in 250,000 square feet of new facilities and improvements. Bryant's Sophomore International Experience in more than 50 countries makes it possible for almost half of all Bryant students to study abroad. The University of Rhode Island, a major research university regularly rcognized as one of the best colleges in Rhode Island, enrolls more than 14,000 undergraduates annually. URI has a major presence in the state; about 22% of all Rhode Islanders with four-year degrees claim URI as their alma mater. The university is known in and out of the state as one of the top Rhode Island colleges. Offering ninety-one bachelor's degree programs, students have the opportunity to choose the course of study that is right for them. Some of the school's most popular majors include nursing, communication studies, and psychology. As a major research university, the University of Rhode Island researchers received $86.2 million in grants in 2015, including $6 million for biomedical research. Students benefit from this emphasis on research by being invited to participate in research projects both in and out of class, often in paid positions. The school also boasts 18 varsity athletic teams and 15 club teams. Salve Regina University, one of the best colleges in Rhode Island, is located in historic Newport, Rhode Island. The picturesque 80-acre campus features 21 historically significant structures from the 19th and early 20th centuries, which have been adapted for current use by the school. Founded by the Catholic Sisters of Mercy, Salve Regina offers a liberal arts education that is accredited by the New England Association of Schools and Colleges. Salve Regina offers 46 undergraduate majors as well as many undergraduate minors, from biology to cultural and historic preservation, global business and economics to neuroscience. One of the more diverse Rhode Island colleges, 68% of Salve Regina's students are from outside the state, including from 26 different countries. Students have the opportunity to gain global perspectives, with 200 study abroad programs in 45 countries around the world. The New England Institute of Technology is accredited by the New England Association of Schools and Colleges, and many programs have individual accreditation as well. It is one of the best colleges in Rhode Island for technical career education, with a commitment to garnering hands-on experience for students. About 3,000 students are currently enrolled in New England Tech. The New England Institute of Technology offers 19 bachelor's degree programs, ranging from digital media production, to criminal justice, to video game design, to mechanical engineering technology. Programs are designed with input from industry professionals as well as educators. Unlike many other Rhode Island colleges, students must first have completed an associate degree, either at the New England Institute of Technology or another school, before beginning a bachelor's program. Bachelor's degrees can be completed in as little as three years, and classes conveniently start four times year round: January, March/April, July, and October. Founded in 1854, Rhode Island College is the oldest of the Rhode Island colleges. Rhode Island College students will find nearly 90 majors and programs to choose from, among five schools: School of Social Work, School of Nursing, School of Management, Faculty of Arts & Sciences, and Feinstein School of Education & Human Development. About half of Rhode Island College's undergraduate students pursue a professional degree, such as nursing, with the other half pursuing liberal arts and management degrees. Nearly half of the classes taught at Rhode Island College have 20 or fewer students, with a student-faculty ratio of 14 to 1.
Notable alumni at one of the best colleges in Rhode Island include numerous politicians, including members of the Rhode Island House of Representatives and the Rhode Island Senate, performing arts leader Steven Libman, and suffragist Annie Smith Peck. Roger Williams University stands out from other Rhode Island colleges because of its focus on project-based, experiential learning. Named after the state of Rhode Island's founder, Roger Williams University is committed to his ideals of education, freedom, and tolerance. Undergraduates can choose from 40 academic majors. Unique programs include one of the country's few bachelor of science degrees in marine biology and a bachelor's degree in historic preservation. RWU has gained a reputation as one of the best colleges in Rhode Island as well as one of the greenest colleges in the country because of its commitment to sustainability and environmental issues. The college is also known as one of the best in the country for its food. Located in Bristol, Rhode Island, the Roger Williams campus was formerly a dairy farm. Johnson & Wales University at Providence is one of the best colleges in Rhode Island. Founded in 1914, the school has four locations, although the Providence campus is JWU's first and largest. Best known for its culinary arts programs, Johnson & Wales offers a wide variety of undergraduate degrees ranging from criminal justice to software engineering. Many degrees related to hospitality and business are also offered. The Providence campus programs are divided up among the School of Science & Liberal Arts, School of Professional Studies, College of Culinary Arts, School of Engineering & Design, College of Health and Wellness, and College of Management (School of Business and School of Hospitality). Johnson & Wales prioritizes placing students in internships that help them make valuable connections in the professional world, with more than 1,400 internships in 48 states and 30 countries. Students complete more than 240,000 community service hours per year -- high amongst Rhode Island colleges -- demonstrating the school's commitment to bettering the world. In Rhode Island, many two-year programs focus on technology training for students looking to launch a career in the state. Community college programs in Rhode Island are tailored to provide the skills career-oriented students need to find jobs in local industries. The state's only two-year institution, the Community College of Rhode Island, has six locations that serves students across disciplines and specializations. According to the U.S. Department of Education, graduates from the Community College of Rhode Island earn a higher salary than workers without college experience. With healthcare, manufacturing and education among the state's top industries, community colleges and trade schools in the state produce skilled labor for jobs in key industries. To learn more about the specialized programs in the state, check out our review below. The largest two-year higher education institution in New England, Community College of Rhode Island serves as many as 18,000 students each year. The school, known locally as CCRI, has grown quickly over the years. Starting with a little more than 300 students in 1964, it now has more than 300 full-time faculty members alone. But CCRI isn’t just one of the best community colleges in Rhode Island because of its size and the expertise of the instructors -- the school has invested in cutting-edge technology and education at each of its four campuses. For example, the Newport campus is among the most advanced in the U.S. with 16 “smart classrooms” loaded with the newest teaching technologies. CCRI students can pursue an associate of science, arts, fine arts, applied sciences, or technical sciences in a variety of fields, including social sciences, business administration, nursing, fire science, computer studies, and many more. Students at each of the four campuses -- as well as online learners -- can take advantage of a wide range of student services at CCRI. In addition, more than 64,000 CCRI graduates live or work in the Ocean State, providing an excellent network of alumni for students to contact. Transferring from CCRI to local universities is made easy. There are simple paths to Bryant University, UMass-Dartmouth, and Johnson & Wales University, among other schools. CCRI is also particularly diverse in regards to ethnicity, age, and gender, as well as open to part-time learners. If you're thinking about applying to one of the best colleges in Rhode Island, continuing reading to learn more about living in the Ocean State. Rhode Island is the smallest and second-most densely populated state in the country. Nicknamed “The Ocean State,” Rhode Island's water composition accounts for 14% of its total area, encompassing several bays, inlets and waterways near its coastal border. Rhode Island played a key role in the American Revolution, as the first of the thirteen colonies to declare its independence and the last to ratify the Constitution. More than half of Rhode Island residents are native to the state, and service-based commercial industries play a significant role in the local economy. Rhode Island had a per-capita income of $30,765 a year as of 2014. A U.S. census of national statistics from 2009 to 2013 reported that 31.4% of Rhode Islanders 25 and older had a bachelor's degree or higher, well above the national average of 29.3%. Establishing residency allows students access to in-state tuition at public colleges in Rhode Island. Students 18 or older must provide proof of state residency; minors have to live with either a parent or legal guardian to qualify for in-state tuition. If a student is a minor when they enroll, they must prove that their guardians reside in the state to claim residency themselves. To establish Rhode Island residency, a minor must live with a parent or guardian in a household within state borders. If the parents are divorced or separated, the minor must reside with a parent living in Rhode Island. Minors must provide evidence that they lived with their parent in Rhode Island before turning 18 and prove their intention to continue living with that parent until the school year begins. You must live in Rhode Island for at least one year prior to declaring residence. You must prove intent to make Rhode Island your home.